Android 8.1 activated the Pixel Visual Core feature, enhancing the images taken with the already highly regarded cameras on the Pixel 2 and Pixel 2 XL. And while the update also brought a security update with it, the new build created a little problem of its own. 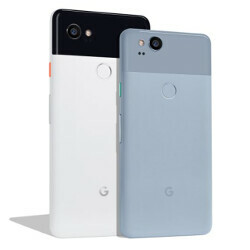 It was back on December 7th when the first thread appeared on the Google Support Forum describing an issue that was preventing some Pixel 2/2 XL and Nexus users from swiping up on the lock screen to enter their PIN code. According to the threads that have been posted, it can take multiple attempts at swiping before the handset figures out that you want to enter your PIN code to unlock it. Notifications on the lock screen can also take multiple swipe attempts to get rid of. Accepting or declining incoming phone calls can also become a chore thanks to this bug. This is an example of what is so maddening about the Pixel 2 and Pixel 2 XL. Specs-wise and design-wise these handsets should both be among the best Android phones of 2017. But issues with the screen, speakers and swiping are frustrating users. Google is said to be looking into the matter. Since a software update apparently brought on this problem, you would think that another update is all that would be required to fix it. If we hear anything new about this bug, we will pass it along to you. My works without issue... Is this something widespread?? Its only on occasion for me. It's more of the short swipe (like down to ignore a call) that i have to do it a couple times. Nothing here......Oh sorry I have an iPhone. As usual, the stock android has more bigger bugs than skinned roms. Since I updated my Nexux 5X with Oreo, it's doing the bootloop. I guess it's a dead brick now. Another day, another Pixel issue... Stock Android is losing it's appeal by the day.